Everyone loves a live demo. HYPR Corp. CTO Bojan Simic is on tour giving live demos of our biometric authentication SDK and discussing how passwords are being phased out. 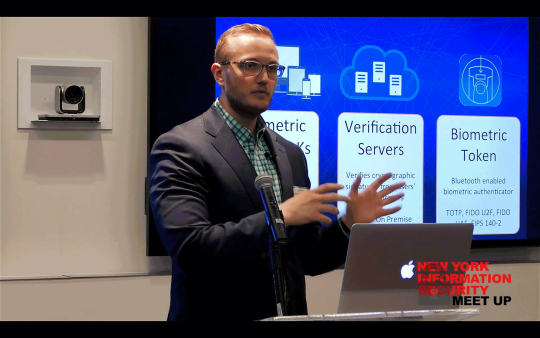 In a recent appearance at the NY Information Security Meetup, Bojan spoke to 100 attendees and demoed HYPR’s biometric tokenization solution to the longstanding problems of outdated 2 Factor technology. Bojan shows the crowd a POC of biometric-based login into his personal financial services account without the use of passwords. He uses the enterprise-targeted HYPR Token, a standalone Trusted Execution Environment (TEE) with a with an embedded 3D fingerprint sensor. The video demo illustrates how identity validation occurs when the HYPR Biometric Token is used for login. A preference for the HYPR device would be due to the enterprise’s FIPS 140-2 Level 3 compliance, rejection of a Bring Your Own Device (BYOD) policy, or other mission-critical guidelines. In the case of the demo video, the HYPR Biometric Token is employed to show how biometric authentication can be utilized even when the user lacks a mobile device with embedded biometric sensor and TEE. In 2016 far more mobile devices with embedded biometric sensors and TEEs will be shipped as the fragmented Android device manufacturers catch up with Apple’s distribution of iPhones with Touch ID. We invite enterprise security teams to schedule an evaluation of the HYPR Biometric Security platform.